30%. This mode naturally relies on historic sectors such as coal and ore, but now offers promising prospects in combined transport, as can be seen in the doubled frequency of the container shuttle to and from the Greater Paris area (Bonneuil). 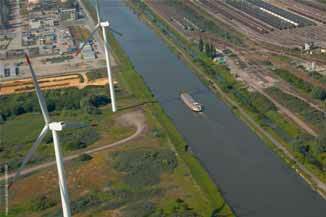 Grain procurements have also soared in recent months, extending the hinterland of the Port of Dunkirk to new markets. In consolidating their overland traffic at Dunkirk, shippers are making use of the largest maritime infrastructures available. Waterway transport also continues to develop, with a modal share up one point at 16%. The main traffic concerned is grain (1.19 mt [million tonnes]), a sector in which the modal share is as high as 52%. Combined transport is growing too, and should experience a new boost in 2015 with the deployment of new services for northern France. The volumes carried by the Nord Ports Shuttle (NPS), which started up in November 2013, became permanent in 2014. Finally, pipeline transport now accounts for 3% of traffic, in particular since liquid bulk operators have connected to the Trapil national network. The opening of the LNG terminal should contribute to the reinforcement of this mode in coming years. Including the traffic of the maritime industrial area, rail traffic reached 13.4mt in 2014, strengthening the port’s position as a leading freight hub in France. Waterway traffic exceeded 3mt for the first time in 2014, marking Dunkirk more than ever as the foremost inland waterway port of the Nord-Pas de Calais region. France’s third-ranking port, Dunkirk is well known as a port handling heavy bulk cargoes for its numerous industrial installations. It has also built its reputation in other sectors such as cross-Channel RORO traffic to Great Britain, containers, fruit, etc. Classified as the seventh port of the North Europe Range which extends from Le Havre to Hamburg, Dunkirk is also the leading French port for ore and coal imports, France’s leading port for containerized fruit imports, and the country’s second-ranking port for trade with Great Britain.